Mapo tofu is a dish that, in many ways, defies classification or explanation. It is, in a sense, rather familiar, appearing on countless restaurant menus and home tables alike. There’s a good chance you’ve had mapo tofu, or at least seen it on a take-out menu, but let me dive into it a little bit for the uninitiated. It’s a fairly simple combination of soft tofu and (usually) ground pork with a few vegetables, served in a richly flavorful (but wildly variable) sauce. While it’s a far cry from the heavy, meat-centric dishes one frequently encounters on westernized Chinese menus, the dish’s texture and balance of sweet, sour, spicy, and savoury are prized in authentic Chinese cooking – which I suppose accounts for its fairly universal popularity. Because of this, and because it introduces a few very important ingredients and techniques, it’s an ideal dish to learn, adapt, and make your own; rather like a Chinese version of meatloaf, it invites adaptation and branding by the home cook. It’s also a recipe with a great name – and one that serves as a fun introduction to another fascinating part of Chinese culture – names and titles. The name mapo tofu seems a bit bizarre at first blush – literally translated, it’s a truncation of mázi pópo (麻子婆婆), which basically means ‘pockmarked old woman.’ So this is the tofu of a pockmarked old woman. Sounds great, doesn’t it? The thing is, the name isn’t really meant to mock anyone, or even to sound particularly off-colour. In order to understand why that is, we have to look at both the ‘pockmarked’ and ‘old woman’ parts separately. Chinese nicknames can come from a variety of sources, and (as in the West) are frequently related to some sort of physical characteristic or personality feature. But it’s neither uncommon nor impolite in Chinese culture to point out features based on physical attributes that westerners might find a little gauche; Chinese nicknames frequently feature monikers like ‘fat’ or ‘old.’ While this might strike English speakers as impolite, it’s rooted in a different overall attitude toward physical characteristics; it’s generally understood that a physical observation is made without ridicule or judgement (at least in this sort of setting). If you’re called ‘old,’ it’s because you’re old. We can assume that the pópo who made this dish famous was indeed pockmarked, but was not being mocked for it. In fact, the physical aspect of her title/nickname may have helped to differentiate her from other food sellers or cooks. I would even speculate that the title might have been embraced specifically to draw in customers – after all, there was probably only one pockmarked old lady selling tofu. Alright, so we’ve covered the pockmarked angle – what about the ‘old woman’ aspect? Well, it’s actually related to a complex naming culture that’s actually quite concerned with politeness. Using a person’s given name is frequently considered impolite, or even taboo. Instead, honorifics are generally used when speaking to or about relatives, older people, teachers, rulers, etc. I first encountered this myself when I visited Taiwan with my wife after we got married. I was being given a crash-course in the titles of her many extended family members. While trying to remember it all, I idly wondered what their given names were. My wife’s answer surprised me – she told me she didn’t know. Her aunts and uncles were simply never referred to by their given names – at least not in her presence while she was growing up. This system extends to strangers too, albeit in a slightly less structured manner. I’ll limit my examples to female acquaintances given the recipe we’re talking about. Depending on the circumstances, your status, and how close you are to a person, you might call a young woman (or child) mèimei (妹妹), meaning little sister or jiějiě (姐姐, older sister). But the title that comes up time and time again is ‘auntie.’ If you’re talking to a woman old enough to be considered your elder (and that’s a loose concept that often errs on the side of caution), the word auntie (阿姨, āyí) flies fast and furious. When my wife and I introduce our kids to any female friend or relative, she’s automatically ‘auntie.’ You don’t need to attach a name to this title (though you can) – simply ‘auntie’ suffices. Things do get confusing when you’re working across generations though; while we were in Taiwan my wife’s older cousin’s adult children (got that?) called her auntie, even though they were her around her age, because the generational aspect took priority. Phew. So what about pópo? ‘Old woman’ might not sound terribly polite on its own, but that’s a situation-specific and somewhat misleading translation. Pópo is used to refer to one’s mother-in-law – specifically the husband’s mother. It can also be used, by extension, to mean grandma. But as we’ve just established with ‘auntie,’ these terms bleed beyond the edges of the family and can also be used in other settings. Once you’ve graduated from middle-age, the term auntie gets dropped and ‘grandma’ starts making the rounds instead. I’m not sure who makes the decision on this one – maybe it’s sort of like getting called ma’am. It just starts happening one day, like it or not. In any case, the term mázi pópo, is not a reference to someone’s specific blood relative, but rather an older woman (or ‘granny’) who first (or best) made and sold the dish in Chengdu (the capital of Szechuan, China). In fact, while she may have been someone’s actual mother-in-law/grandma, those relatives would almost certainly not have called her ‘pockmarked’ – she simply would have been pópo to them. The actual identity of the old woman seems to be lost to history, but she’d no doubt be pleased that her creation is still filling hungry bellies all these years later. Whether or not she’d be pleased to see us all play with the recipe is up for debate – but I’m going to encourage you to do just that. Making it your own will make the recipe more satisfying and enjoyable while simultaneously teaching you to become more confident with Chinese ingredients and cooking as a whole. 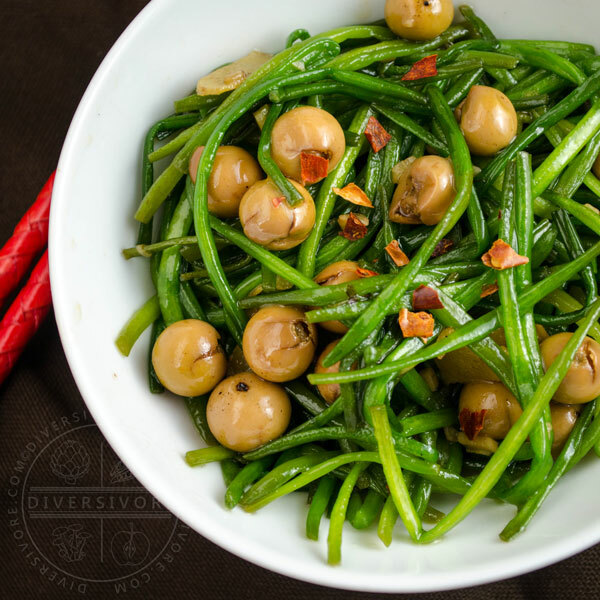 There are a few ingredients here that might be unfamiliar if you’re new to Chinese cooking, but this also happens to be a great recipe for learning to use and incorporate them into your cooking. I’ll get into those in a moment – but first, a note on spice. Alright, let’s talk about doubanjiang! First, doubanjiang, or spicy broad bean paste, is an irreplaceable condiment (and staple of the Chinese cupboard) that you should be able to track down at any Asian grocer. It comes in spicy (辣 – là in Chinese) and non-spicy versions, and I encourage you to explore a few different varieties over time to find your favorite. If you’re not sure what type you’re buying based on the label, check the ingredients. As a general rule, I find that spicy doubanjiang is easier to find than non-spicy, at least in my neck of the woods. You may encounter a variety of related bean-based spice pastes too, including those made with soy beans and black beans (which are not black turtle beans, but black soy beans). There’s nothing wrong with using these, though I prefer to start with a good, basic doubanjiang before doing too much experimenting – especially in a classic dish like mapo tofu. If you must substitute for doubanjiang, look to another pungent/salty sauce like red miso or Korean doenjang. They’re definitely not the same thing, but they achieve the same sort of thing in a recipe – i.e. a salty, pungent, fermented, savoury flavour. If you go the Korean route you can use a mixture of doenjang and gochujang to adjust the spice level to your tastes. Your end dish might have a more Korean than Sichuan flare, but it’ll still be great. No access to any bean pastes at all? Well things get tricky, but it’s not impossible. Substitute the missing doubanjiang for a light soy sauce or (even better) soy paste, mixed with a little hot/chili sauce. About 1 tsp of each should do. The ketchup will still carry a lot of flavour in the sauce, so you’ll still end up with a tasty dish, albeit one without that distinctive savoury ‘bean’ flavour. Wait did he say ketchup? Yes, that’s right… ketchup. Before you go and call out sacrilege in the comments section, ketchup (or something like it) is actually a relatively common ingredient in many Chinese dishes, and you can even find less-sweet Chinese versions of it (and no-sugar-added Western versions). In fact, ketchup started out as a Chinese sauce – albeit a very different one. The word is thought to come from the Amoy dialect kê-chiap (鮭汁), which was a fermented mixture of pickled fish and spices. Definitely not the french-fry dipper we think of today. Nonetheless, the sauce works well when used judiciously in many Chinese recipes, as it provides an umami-rich flavour with a nice balance of sweet and sour. As I mentioned, there are Chinese and Western ketchup varieties out there with less sugar added, but I like sweetness in my Szechuan food, so I use a standard variety. If you want to avoid ketchup altogether, you can use a tomato paste mixed one-to-one with rice vinegar, then adjust this to your tastes by adding sugar. As with a great many dishes from Sichuan, mapo tofu is notorious for its fiery heat. This heat in this version would be unlikely to satisfy the taste buds of Chengdu, but it’s got just enough heat to keep me happy… and way too much to keep my spice-averse children happy. Fortunately, we can play with the heat quite a bit, so you can adapt this to your tastes easily. The simplest way to add some fire to the dish is by garnishing with extra chilies. That being said, adding fresh chilies to a dish is not the most common way to modify heat in Chinese recipes – in fact, fresh chilies aren’t use with the frequency of dried or pickled chilies in general. If you’re looking to go the garnish route, I would suggest using chili oil to allow diners to modify the heat to their own liking. To spice things up during the cooking stage you can add some extra chilies during the stir-frying stage. This gives a more well-rounded spice and flavour than you’d get by garnishing with the same chilies. You could theoretically increase the amount of spicy doubanjiang in the recipe, but I would encourage you to do so judiciously, as this will add more of the pungent, salty, fermented bean paste flavour as well as heat. Overdoing it could easily render your mapo tofu ridiculously salty. Now, what to do if you want a less-spicy version? No judgement here – I’m used to these kinds of adjustments – despite my best efforts to acclimatize them to heat, my kids still tend to complain if I so much as wave a chili pepper in the vicinity of their food. Sigh. Fortunately you can still have your mapo tofu and eat it too. Reduce or even eliminate the chilies from the stir-frying stage, or better yet, swap in a much milder red chili. Stay away from sweet bell peppers though – they’re too juicy and won’t really stir-fry the same way. Don’t forget to get the seeds and membranes out of your chilies too, as they’re the source of most of the capsaicin-induced heat. Once you’ve decided what to do with your chilies, you can move your focus to the doubanjiang. Many (but not all) doubanjiang pastes are spicy (as I mention above). Use a la (spicy) doubanjiang if you like heat, but if you want to make this dish without the fire, look for a paste that doesn’t have added chilies. If you’re uncertain what you’re getting based on the packaging, check the ingredient list. Mapo tofu, like a lot of Chinese recipes, contains meat without really focusing on the meat. Meat is one ingredient among many, rather than the core of the dish. As such, it’s pretty easy to make this vegan (or pescetarian). First and foremost, omit the pork. Keep the sesame oil though – just add it to the sauce for the tofu. Substitute chicken stock for veggie stock or water (if you use water you’ll want to add a pinch of extra salt to the sauce). At this point you’re most of the way there, and the dish is now pescetarian (i.e. it still contains seafood). If you want to go full-on vegan for it, swap the oyster sauce for vegetarian oyster sauce. Both are easily found at well-stocked Chinese grocery stores. NOTE: the nutritional information does not include rice. GOOD NEWS:Low in calories, fairly high in protein. The fat content is moderate, and can be reduced by making a vegetarian version (remove the ground pork) or by using a lean meat like ground turkey. BAD NEWS:The combination of Chinese soy-based sauces and other high-salt ingredients means that this dish is fairly high in sodium. Consider adjusting your cooking with low-sodium sauces, and/or eliminate the added salt from the pork and sauce stages of the recipe. *Note – As with a LOT of recipes using Chinese ingredients, whether or not this is wheat/gluten-free will depend on the sauces you choose. GF oyster-flavoured sauce is fairly common, while doubanjiang is all over the place in terms of ingredients, including wheat. Combine pork, sesame oil, salt, and pepper and set aside for 20 minutes. Heat a wok on high for 30 seconds, then add the peanut oil, stirring to coat the sides. When the oil is shimmering and just beginning to give off small puffs of smoke, add the chilies, onion (white part) and garlic and stir fry for 30 seconds. The chilies should start to blacken. Add the pork and stir fry for 1 minute. Add the tofu and gently stir to combine. Cook for about 3 minutes or until heated through. Make a well in the mixture and pour in the sauce. Mix together, stirring regularly until the sauce thickens. Add onion greens, stir, and serve. This is one of my favourite dishes and this version is easy to whip together and healthier than the restaurant version. First…I would not omit the pork (however my son-in-law would). This sounds like a very interesting dish. I am not a tofu lover, but I would be willing to give this a try. Love the spice, and I know hubby would too. I live in Ontario (at least an hour from any GREAT Asian markets). I find it so frustrating to find some of these wonderful ingredients. However, I do have ketchup LOL. Several kinds even. We are not lovers of takeout food. When you can make wonderful meals like this at home (with or without ALL the ingredients), save yourself some money (lots of money) and eat better food. I can just imagine the leftovers would be amazing!! I definitely like to leave the pork in too. A little bit goes a long way in a recipe like this. I wasn’t a big tofu fan when I was younger but was (mercifully) exposed to a large number of dishes where it’s done right when I met my wife and now I’m a die-hard fan. That being said, the softer tofu used to make mapo tofu is probably the trickiest one to get right in a savoury dish. I can imagine it must be frustrating to have a tough time accessing the good ingredients, though online ordering is making shelf-stable goods WAY easier to get a hold of, so that’s certainly something. I do hope you have fun with this recipe – and I’m neither afraid nor ashamed to say long live the ketchup! You know, I’ve always wanted to mow down the tofu of a pockmarked old woman. Haha. Humorous translation aside, this dish has so much flavor going for it. One thing I find I have a hard time tracking down are bird’s eye chilis. Back in Canada, I was able to easily get them at a small Korean market. Since moving to the South, I can’t find them; not at my local Chinese market or “Grand Asia” market, which touches on most of East and Southeast Asia. What would you reckon is a good substitute? As you know, when you’re familiar with peppers and spicy foods, you can distinguish a flavor there, aside from the heat. I wouldn’t want to sub-in a rando hot pepper—just because its hot—and end up butchering the dish/how it’s supposed to be. I love a good tofu dish, though. This is a WIN. I love tofu, at least when it’s prepared well. To me, this looks heavenly. And my husband and I love some heat, and this certainly fits the bill, but I appreciate your tips on varying the heat level. I’ve never made Mapo Tofu, but I absolutely will be making this recipe. As always, your explanation of the history and ingredients is fascinating and so well written. And the photography is gorgeous, too. Thanks again for a beautiful and exciting recipe for us to delve into. Bravo! As far as the spice on this- bring on all those extra chilies! It’s so fun to go back and rework old recipes. Sort of a trip back to the past. What a gorgeous recipe! Thanks for providing so many options so people can work it into the diet that works for them. When I cook Asian inspired cuisine, I love to use mostly plant based ingredients, and just a little meat. I’ve been doing it this way for years, as personal preference mostly. I always love to stumble across the same ratios in other’s cooking as well. This is one beautiful dish! Thanks for the background info and thanks for sharing the recipe! I always love to read your explanations and background stories. They are fascinating and as far as funny names go, Italian dishes also have funny names when they’re translated. We certainly enjoy our Asian dishes and love experimenting and trying new ones. Mapo Tofu sounds very interesting and the ingredients we don’t have we do have an Asian market nearby that would. And we certainly have ketchup. Thank you for the history of the dish and some information on the culture surrounding it! I’m always interested in delving into such things. Personally, I would make this just as written since it sounds and looks amazing, and I love dishes with meat which don’t focus on the meat. It keeps the meat in its place. As for the spice, we’re at the point were I can occasionally wave a chili pepper at my daughter’s food, so I’ll take your spice adjustments into consideration when I’m building the heat in the recipe. Such an interesting background to this dish. I appreciate the education, and the opportunity to try something new. Thanks for the vegan options, definitely a game changer fo us and I’m excited to make this. I love the background of this dish. The mental image of a pockmarked old woman definitely brings to mind something a little different than this delicious recipe. We’ve been trying to incorporate some more vegan meals into our diet to help cut down on environmental impact, so this immediately makes it onto our menu plan! Now I just have to go track down all those other fun ingredients! Thanks for the fun background education! Wow! I am so interested in the naming conventions. I never would’ve thought “pock marked old woman” would be a term of endearment fo a mothe r oin law or grandma. The more you know! Personally, I’m a big fan of tofu with ground pork. This dish sounds fantastic!